15 delegations of the Americas are heading to compete in the 1st ever pre-qualifiers to Lima 2019. 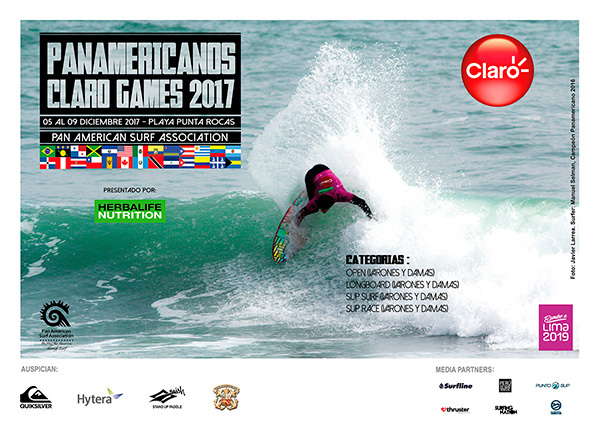 A record number of participants is expected for the XIII edition of the Pan American Surf Games, Pan American Claro Games 2017 presented by Herbalife, from December 5 – 9 in Punta Rocas, Lima, Peru. More than 250 athletes and coaches will visit Peru to be part of this historic event organized by the Pan American Surf Association (PASA), and sponsored by Claro, Herbalife, Quiksilver, Hytera and Naish, with the support of the Organizing Committee of Lima 2019. 15 nations have confirmed so far their participation in this event, setting a new record in attending nations: Argentina, Barbados, Brazil, Canada, Chile, Colombia, Costa Rica, Cuba, Dominican Republic, Ecuador, Mexico, Peru, Puerto Rico, Uruguay and Venezuela. This competition will have the return of Cuba to official competitions, after competing for the first time in the tenth edition of the Pan American Surf Games, held in Guadalupe Island in the Caribbean in 2011. Arnan Lantigua was the first Cuban competitor, now he returns along with his teammate Frank Gonzalez to compete for a chance to reach the highest place in the podium. The event will open on December 4th at 6:00 pm with a Welcome Luau for all the participant nations in Hotel Las Hamacas in Punta Rocas. During this Welcome Luau, we will have the Sands Ceremony, in which each participant nation will pour the sand of one of their national beaches in a box, to symbolize the fraternity and pacific union of the Americas through Surfing. “PASA continues with the great job that the International Surfing Association is doing towards Tokyo 2020 and we feel proud to begin our own path towards the qualifiers to the Tokio Olympic Games, where we will have the first Olympic Medal in the history of our sport”. “This event is also a great opportunity for all the athletes to get to know the wave that will take them to Tokyo, during the Lima 2019 Pan American Games, so good luck to all the participants and see you soon in Peru”. The local organizers have decided to move the event to Punta Rocas, the legendary wave that hosted the second World Surfing Championship in 1965, when the Peruvian Felipe Pomar was the first Pan American athlete to become a World Champion. Punta Rocas will be also the host of the Surfing disciplines in Lima 2019. This event will work as a test for the Organizing Committee of Lima 2019. Punta Rocas is one of the most consistent waves in the Americas, with waves almost 365 days a year. It holds sizes from 5 to 12 feet (1.5 to 4 meters), which will give the athletes an excellent stage to give all the fans and attending crowds a great show. This will be a pre-qualifier event towards Lima 2019, which means that the participating teams will have the opportunity to get better seeding in the competition heats in 2018. You can watch the event live through the webcast in www.pasasurf.org. The Pan American Surf Association (PASA) was founded in 1994 with the primary goal of organizing, promoting, and regulating surfing activities throughout the PASA territory, which includes the whole American continent, (North, Central and South), including all the adjacent islands and the Caribbean. The current directory is formed by President Karin Sierralta (PER), Vice President Xavier Aguirre (ECU) and Secretary Paula Muñoz (CHI). PASA headquarters are located in Lima, Peru.